As per Hinduism, meditation (Tapasya) and proper understanding of the cycle of life on earth will help in overcoming pain associated with many diseases. 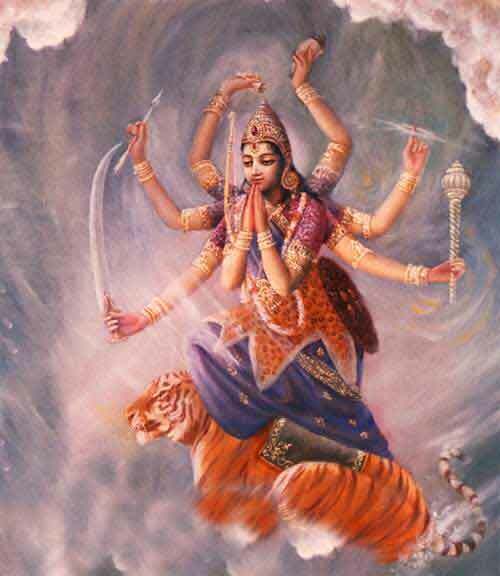 Here is a Goddess Durga Mantra to fight cancer. Please note that the mantra helps in building confidence to fight pain and fear of cancer. How To Chant Durga Mantra To Fight Cancer? After taking bath at a convenient time, find a quiet place in the east part of the house. Sit facing east or northeast. Create a mental image of Goddess Durga or any form of Mother Goddess Shakti in mind. Worship the form mentally. There is no need to make any kind of real offering. Meditate on the form of Mother Goddess as long as you want. After meditation, chant the above given mantra 108 times. Continue this for any number of days. To overcome any kind of problems in life we need to shed fear and follow Dharma. The Karmas of previous life will follow us and they can be correct only through actions of this life. For a better life here and hereafter we need to follow Dharma - never to hurt another living being for our selfish needs.